BIG UP JIME & ODE 2019 !!! This is a solemn message to the APC Party members in Benue State, the rank and file, hard-working members, in particular, not to get drawn into any elitist fractional squabble, arising from the choice of Dr Sam Ode as Emmanuel Jime Esquire’s running mate for the position of Governor of Benue State, 2019. 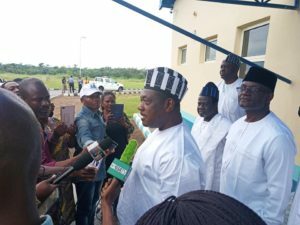 The Elders and Leaders of Benue APC organised a rigorous, transparent screening process, and resorted to voting to decide, who the running mate of the party’s Governorship candidate would be. 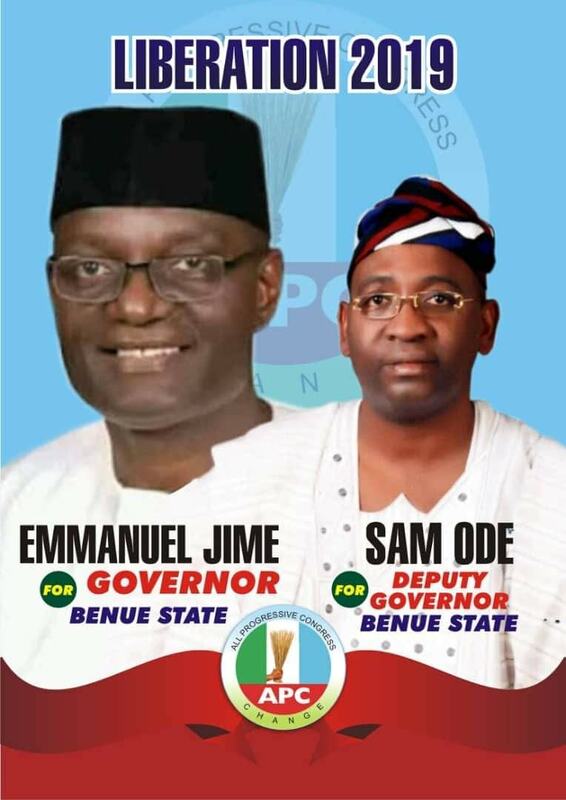 As the emergent candidate, Emmanuel Jime Esquire wisely waived his discretion to appoint his running mate, taking cognizance of the peculiar political terrain of Benue State. As a consequence of that democratised process of selection, Dr Sam Ode is elected by the party leaders as Jime Esquire’s running mate. So soon thereafter, pandemonium broke out in the party. One or two party elites felt their name should be substituted as the running mate. We heard threats of switching party allegiance, ridiculous anti-party activities to subvert the electoral chances of the party’s governorship candidates, all sorts of threats, noise, discontentment, real or feigned, etc. The noble High Chief Audu Ogbeh and Distinguished Senator George Akume, with other party leaders, stateside and nationwide exerted their best endeavour, to ensure that the nominated candidate Dr Sam Ode is not undemocratically substituted for another party elite. We salute their equitable and dynamic leadership role on this occasion and trust this renewed spirit of cooperation and budding culture of consensus building will be sustained. The refusal to undemocratically substitute the name of Dr Sam Ode for another party elite is also a significant departure from the usually dysfunctional political party governance in Nigeria. Historically, political parties in Nigeria are dominated by “Big Men” or petty bourgeois “God Fathers” at the expense of party members, who hijack the control of the parties by undemocratic means, pay the pipers, dictate the tunes. 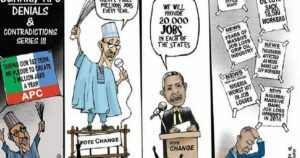 This is also an opportunity for the APC in Benue to build and assert its identity as different from the PDP, demonstrating a more democratic, inclusive and transparent party management ethos, with a clear ideological framework of welfarism, state participation in the process of sustainable development, poverty alleviation, radical institutional reforms, restructuring, including state creation. State creation is already constitutionally guaranteed and would be vigorously pursued by those of us committed to it as a fundamental right to development. Nevertheless, the APC led Federal Government must make unambiguous policy pronouncements and initiatives to convince the electorates that the Mallam Nasiru El Rufia led APC Committee report on true federalism, restructuring and state creation is not a mere 2019 election stunt. Still on the petty, churlish, hue and cry over not clinching the Gubernatorial running mate’s ticket of the APC Party. Is being a Deputy Governor the only platform to provide progressive leadership to our people? I recall a conversation with Professor Yakubu Ochefu a few years ago when I was pondering the prospects of running for the Otukpo / Ohimini Federal House of Representatives position. He asked me, what about running for the then vacant position of Chairman Otukpo Local Government Council? And he was spot on. It is also a veritable strategic position to provide good popular governance. We can’t all be Members of the House of Representatives, neither can we all be Senators, Governors, Deputy Governors, etc. But we can all individually and collectively provide commendable distinguished service to our people, in various spheres. Thus some folks feel aggrieved that they were not appointed as Jime Esquire’s running mate. While others feel unhappy that their preferred candidate was not selected. And consequently, they would rally their supporters and others to decamp from the APC? Wow!! Is that constructive leadership, to engage in anti-party subversive activities? To turncoats like a traitor or a mere self-seeking mercenary? Is that a wise or progressive response? Many of the APC members and others are aware of my support for Dr John Ofutu as Jime Esquire’s running mate. Dr Ofutu (whom I fondly call Dr Jay), is one of my closest childhood friends. I lived with Dr Jay when I first arrived in London nearly three decades ago. Dr Jay was at one point the front-runner in the selection of the running mate. When the tide was turning in favour of Dr Ode, I was with him at Zanzibar, Maitama, when he told Jime Esquire, that he would energetically support whomever the party selects as his running mate. That he does not have to be a Deputy Governor to be of qualitative service to Benue State and our beloved country Nigeria. In fact, some of us close to Dr Jay had to plead with him to even remain in the race, as he was frankly blasé about it. Many times, Dr Jay threatened to pull out of the race, fly back to London, for many reasons, especially as Honourable Nelson Alapa whom he was initially campaigning for would not readily endorse him. Neither would Honourable Alapa appraise the fact that he was constrained to join the race, not for his personal ambition but what is conceived to be for the better interest of APC in Benue State. 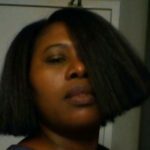 Whence, Ms Maureen Agboh Attorney and a few others, sounding as bell weather, hinted there were critical reviews afoot. Dr Jay asked us to support whomever Jime Esquire and the Party settles for as the running mate. That is a progressive, collaborative, selfless leadership. I hereby respectfully urge all members of APC in Benue State, particularly those in Zone C, expressing some dissatisfaction over the party’s inability to select their preferred candidate, to please, reconsider their stance. I understand their feeling. I was supporting Dr Jay. Should we all, therefore, resort to anti-party activities because our preferred candidate was not selected? God forbid. That would be cutting the nose to spite the face. Folks, we are supporting our party APC, Jime Esquire and Dr Ode as the next Governor and Deputy Governor of Benue State. To succeed in the 2019 election, we must strengthen the pillars of our party, rally the base, deepen internal democracy and canvass a radical transformative vision for Benue State. The era of “automatic” dysfunctional leadership in Benue State, that reproduces poverty, porous philosophy, purposeless policies and penury, is over. As a valedictory 2019 message to the PDP Ortom’s regime, all the Senators, former governor, former ministers and goons trying to resurrect that moribund regime, we say, Mene Mene Tekel Upharsin!! We call on all members of the APC and the good people of Benue State, and say, “peace, be still”. Vote for Jime & Ode, 2019. Vote for a radical break with the past. Vote to break the chain of backwardness in our homeland. Vote for a new era. Vote for a bountiful. better Benue State. Aluta Continua !! Victoria Ascerta ! !